With the growing demand for unique and delicious rice-based cuisine, the old concept now has a new twist. at Lugaw Queen, food is not just served hot and fast but also served with fresh ingredients in a warm Filipino-home atmosphere. Exceptional experience is a unexpected combinations of lugaw with delicious surprises. it is only in Lugaw Queen Where you can find lumpiang shanghai on top of lugaw, or a lugaw that tastes like palabok, It's lugaw at its best, at very affordable prices. The creative blending of flavors and ingredients from the freshest sources, to the way they are served in hot rice bowls make Lugaw Queen reign not just in popularity but in lugaw supremacy. .
Laguna's Famous Lugaw with Chicharon,Egg and Goto(ox tripe) toppings. The best seller of Lugaw Queen. "Reyna sa Lasa! Swak sa Bulsa!". Rice porridge with different toppings.A traditional lugaw seasoned with Lugaw Queen secret recipe with a delicious variant of toppings like Ox Strip, chicken wing, tokwa, siomai, chicharon, egg and many more. Established in November 2007 by Sherwin and Beverly Aquino, LUGAW QUEEN used to be this small take-out counter located in San Pablo City which just plain lugaw for as low as P10 per Serving. With only P1,100.00 starting capital the couple took all the risk to put up a business which they can call their own.Considering the affordable ingredients of lugaw and the passion for cooking of Mrs. Aquino.ordinary lugaw was transformed into a delicious food experience. In three months, LUGAW QUEEN opened two (2) more branches in San Pablo City just before the year ended. it grew to six branches. wih a high demand for it's products. 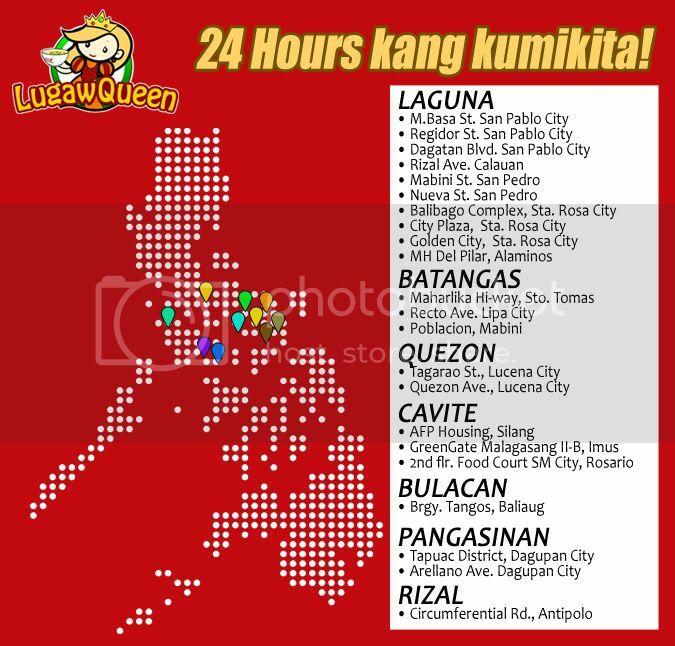 LUGAW QUEEN extended its network within Laguna, Lucena in Quezon and Metro Manila. They grew to more the 12 Branches in Just three years and they are still counting catering to the cravings of lugaw enthusiasts who want to experience the true Pinoy Lugaw with a twist 24 Hours a day! OUR MISSION - To provide the best quality and satisfying taste food products at most affordable price. OUR VISION - A leading innovative fast food chain of quality products with affordable value served by competent people. WHY INVEST IN LUGAW QUEEN? Has wide variety of rice porridge offerings. Has a proven name in quality and delicious Pinoy-style lugaw offerings. Has a system which is easy to operate. Continues product innovation and marketing support. KUMIKITA 24/7 - INTERESTED FRANCHISE?